Below is a full disclosure of the information we collect and how it is used. To make this notice easy to find, we link to it from our home page and other pages of our web site. When you visit our site, we will request your browser to place a permanent cookie (a very small text file) on your computer. If you have your browser configured to accept cookies, it will accept the cookie and place it on your computer's hard drive. We collect this information to analyze where our customers are coming from and how often they visit our site. We also collect certain technical information from your computer, like your IP address and The address of a referring web site, if any. This information will allow us to enhance our site to our customer's preferences. We will not sell or provide this information to any third party for any purpose. You can access all your personally identifiable information that we collect online and maintain by sending an e-mail to Support@ReceptionMagazines.com. We use this procedure to safeguard your information. To protect your privacy and security, we will take reasonable steps to verify your identity before granting access or making corrections. You can correct factual errors in your personally identifiable information by sending us a request that credibly shows the error. If you place an order with a ship-to address that differs from your bill-to address, we retain this information, as well. You can modify or correct this information by following the procedure described above. Such information is used at your request to ship purchased magazines and is not used for marketing purposes, nor will it be sold or otherwise made available to any third parties. When you decide to place an order, you are asked to complete an order form. The order form requires your name, billing and shipping address, credit card number and expiration date. You also include other information fields such as your telephone number, and e-mail address to allow us to contact you regarding your order if necessary. This information is used to make your shopping experience with us as smooth and pleasant as possible. We only share your name and address with the appropriate publisher, and your other information is shared with no one other than ReceptionMagazines.com. 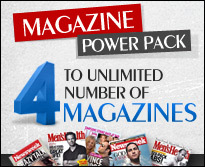 ReceptionMagazines.com does maintain special relationships with a number of business partners. However, no ReceptionMagazines.com customer information is shared with such business partners. You may request to receive the ReceptionMagazines.com monthly flier or e-mail notification of specials that may be of interest to you. ReceptionMagazines.com will never SPAM or send unsolicited materials based on information collected at our site. Registrants may opt out of receiving materials from us at any time by contacting us with such request. Please contact us via e-mail at Support@ReceptionMagazines.com. Include your name, address, and other information as it appears on the mailing label, and indicate "Do not mail". The security of your personal information is very important to us. In an effort to protect your personal information, we use Secure Sockets Layer (SSL) technology with 128 bit encryption. If your browser supports SSL (most current browsers do), it will automatically encrypt the information you provide to us on the secure pages on our site, before sending it over the Internet. ReceptionMagazines.com, has also obtained a digital certificate from a leading provider of Internet trust services. When visiting a page on our site that includes any of your personal information, you will see on the bottom of your browser window, an icon of a closed lock or an unbroken key (depending upon your browser), this indicates that you have successfully connected with our secure server. To authenticate the security of your connection before submitting any of your personal information, you can double click on the icon to display our digital certificate. Our transaction security, combined with our privacy guarantee, should satisfy your concerns regarding online ordering. Keep in mind however that you have a number of alternate choices available for doing business with ReceptionMagazines.com.